Announced earlier this week, HP’s Spectre Folio convertible notebook already looks remarkable due to its leather exterior. As it appears, the system is as impressive inside as it is on the outside, as it incorporates a custom Intel’s Amber Lake-Y multi-chip-module that features an LTE modem. 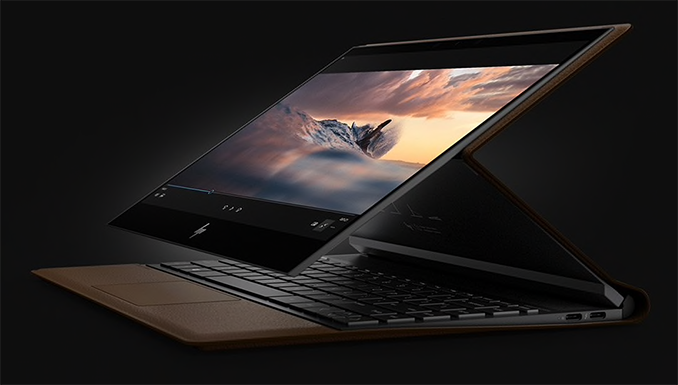 According to a report from PC World, the internal design of the Spectre Folio PC convertible notebook was co-developed by HP and Intel engineers under Intel’s Innovation Excellence Program, which is aimed at enabling PC makers to bring state-of-the-art designs to the market. The product uses a tiny, jointly-designed motherboard that measures only 12,000 mm2 and is based around a unique multi-chip module that carries Intel’s Amber Lake-Y SoC, a PCH (platform controller hub), and Intel’s Intel XMM 7560 LTE Advanced Pro Cat16/Cat 13 modem. Intel/HP did not disclose how integration of a modem affected the TDP of the whole MCM, but it was implied that hot components were intelligently installed in such a way that they would not affect each other and cause performance throttling. Furthermore, the two companies also said that the collaboration helped to shrink the motherboard area from 15,000 mm2 to 12,000 mm2, which normally allows for a bigger battery. Intel is not new to selling complete platforms comprised of a CPU, a chipset, and a communication module. Back in 2000s the company made a fortune selling its Centrino-branded sets containing the aforementioned elements. By selling multiple chips at once, Intel naturally increases its revenue, whereas system vendors ensure compatibility. Therefore, platform-level integration is a win-win for all parties. 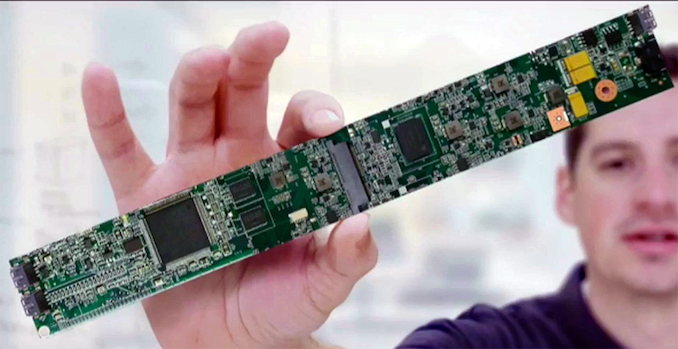 With that said, this is the first time we've seen Intel put a CPU, a PCH, and a cellular modem onto one multi-chip-module in this fashion. So this may be the start of a trend for the company. Earlier this year the chipmaker also introduced its Kaby Lake-G processor, which featured an on-package custom Radeon RX Vega M GPU and 4 GB of HBM2 cache and was designed for laptops that require high-performance discrete graphics. Addressing specialized systems with custom MCMs is a good way to ensure sales of its own components and enable development of PCs that would otherwise might never materialize. To be fair to HP/Intel, the 12" Macbook only has two ports (USB-c, 3.5mm TRRS) and everything is soldered on. The Spectre Folio has a M.2 (NVMe) slot for a removable SSD, two Thunderbolt 3 ports, one USB-c, and the 3.5mm TRRS jack. The TB3 controller set (3 ICs) is not insubstantial, and neither is creating clearance for a 2280 M.2 card. The LTE modem antenna escape routing probably added a bit, too. There's also the benefit for HP, being able to change drive configurations easily. Years down the road, inevitably some will try to open it up as well. I was looking for one of these years ago and none was on the market.